Casey Benjamin's charm depicts the evil eye, a symbol that’s been used for protection for centuries. Two-time cancer survivor Casey Benjamin believes that the jewelry you wear every day can bring "good juju" into your world. 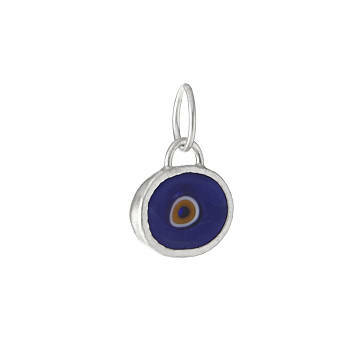 This sterling silver "evil eye" charm is also thought to ward off the bad stuff. Worn for centuries as a symbol of protection against misfortune, Casey believes it creates "an aura of invincibility." Through her own intense cancer treatment, Casey surrounded herself with items that filled her with hope and reminded her to stay optimistic. Now, she's creating inspirational pieces to help others get through their rough times. Whether it's worn alone or paired with other meaningful charms, it's a lovely way to spread a little good juju. Designed and hand-assembled in Brooklyn, New York. Charm: .5" L x .5" W Chain: 18"